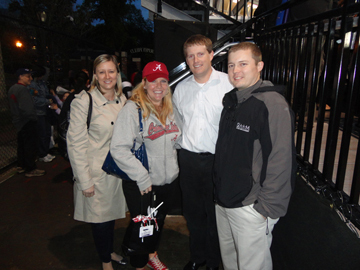 Nearly 90 alumni and friends weathered the rain to see the Crimson Tide play in the Bronx. BRONX, N.Y. -- The Greater New York Chapter was out in full force as nearly 90 Alabama alumni and friends made the trek to Bahoshy Field in the Bronx to watch the third-ranked Alabama softball team take on Fordham. Despite outhitting the Rams, Alabama fell 8-5 in its regular-season finale played near the hometown of senior outfielder/first baseman Cassie Reilly-Boccia, a Yorktown Heights, N.Y., native.